Thiel-a-Vision » The Goblin Thrusts His Spear At Your Gut…What Do You Do? Home > Games	> The Goblin Thrusts His Spear At Your Gut…What Do You Do? The Goblin Thrusts His Spear At Your Gut…What Do You Do? I’d been running a 4th Edition Dungeons & Dragons campaign off-and-on since 2008, but last year I began to tire of it. Oh, there was still a lot that I still liked about 4E. It was the first iteration of D&D in at least 25 years that gave me the confidence to run an ongoing game. And I had a ton of fun crafting custom monsters and building memorable tabletop battlefields. There were downsides as well. Combats tended to be long and somewhat mechanical. The underlying math of 4E’s level advancement assumed that player characters received frequent (and rather generic) magic weapons so that they could maintain parity with increasingly deadly opponents. And, more than anything, I found I didn’t have the free time to achieve the level of customization that I wanted in my campaign. For these and other reasons, I folded my D&D game late last year. Yet I still have a dungeon-building itch that I need to scratch. This is where Dungeon World comes in. It’s a hack of an earlier role-playing game called Apocalypse World, rewriting those rules to give them the flavor and feel of an old-school dungeon crawl. Coincidentally, I stumbled across DW on the very day it launched its wildly successful Kickstarter funding campaign. I plunked down my cash, and I’m told that the softcover rulebook should be along any day now. The basic gameplay of DW revolves around “moves.” The game master asks “What do you do?” and the players describe their characters’ actions; if these trigger one of a number of predetermined moves, they roll dice to see what happens. For example, if a player says, “I leap at the orc and swing my blade at his neck,” it might trigger the Hack and Slash move. The player rolls a pair of six-sided dice, adding modifiers as appropriate. On a result of 10 or more, the action succeeds. On a 7, 8 or 9, the action still succeeds, but there are complications. The orc may wound the character, or perhaps he shouts to call out the reinforcements in the next room. A 6 or less is an outright failure, and an opportunity for the game master to make one of his own moves in response. The main precept of DW is that everything “follows the fiction.” Players can attempt just about anything, but only so far as it fits the fictional world. (Poking a heavily-armored dragon with a dagger isn’t a Hack and Slash move, it’s just a bad idea.) And, as one player pointed out on the Dungeon World forum, there’s nothing in the rulebook to explain how a medusa turns people to stone…a medusa turns people to stone because that’s what a medusa does. Combat runs smoothly. There are no battle grids, no rolling for initiative…and no turns. Players act in whatever order they choose, and therefore can build on each other’s moves. And because the non-player creatures only react to the players’ moves, the game scales easily to fit the size of the gaming group. Even more so than 4E D&D, creating monsters is a snap. Here’s my attempt at writing up Lewis Carroll’s Jabberwock. 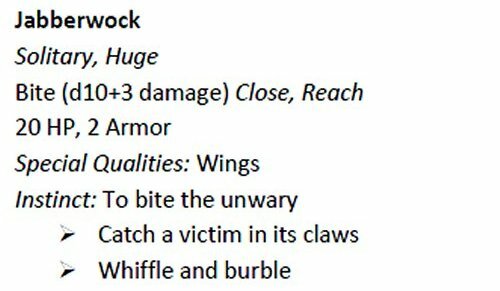 Aside from a brief description, this is all the information you need for a fully-realized monster. And while the moves in the rulebook cover pretty much all of the things one typically does in a dungeon crawl RPG, it’s easy enough to create custom moves for specific situations. 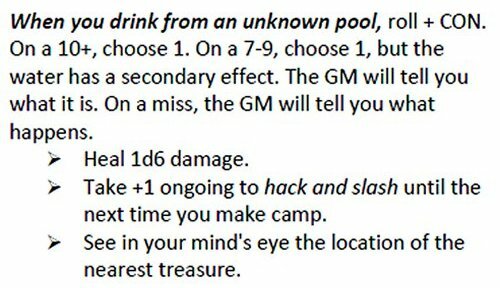 Here’s one I wrote to simulate the “Room of Pools” from the classic 1979 D&D adventure In Search of the Unknown. All this freedom does come with a cost. The game master has to be on his or her toes, tapdancing madly in order to keep up with the players’ improvisations and to give them meaningful choices to make. In fact, Dungeon World actively discourages preparation. It instructs the game master to show up to the first session with only a vague set of notes. He or she asks the players questions about their characters and the relationships between them, and together the group builds the fictional world out of whole cloth. This presents challenges for a gamer such as myself who is used to fully mapped-out dungeon complexes and predetermined storylines. I volunteered to run a DW event at last weekend’s Winter War convention, but was worried about my ability to wing an adventure for a group of strangers. Happily, my initial session went very well. It helped that two of the players had prior experience with the game, and another had read the rules. All five were really into it, and everyone seemed to thoroughly enjoy themselves. I’m hoping to start up a semi-regular game in the not-too-distant future, and will encourage them to return. If you’re interested in learning more about DW, there’s an active community on Google Plus…which represents the sole reason I have anything to do with Google Plus. 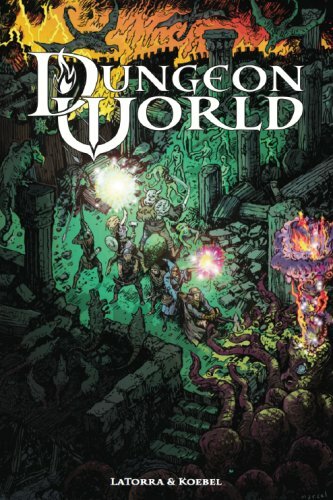 I hope to blog more about Dungeon World in the coming months. Until then, what do you do?